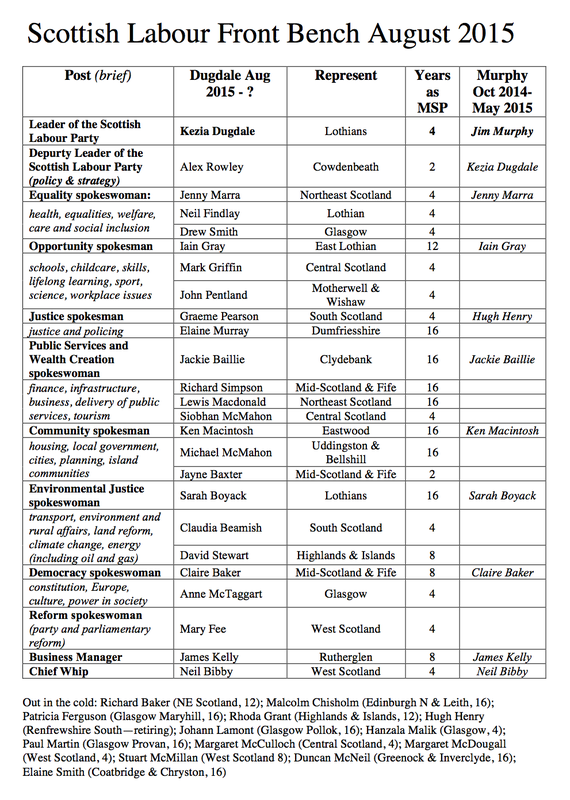 By contrast, in a well mannered and decisive contest, Kezia Dugdale won the Scottish leadership. She was quick out of the gates with her ‘Front Bench Team’, promising change and that “her front bench would be charged with communicating Labour values, rather than shadowing SNP ministers so their portfolios do not necessarily match opposite numbers in government“. A second issue that will surely bewilder punters is that she seems to have fallen into the same trap as the UK Tories of appointing a myriad of colleagues to front bench positions—resulting in scrambles for air time and precious little chance of the disinterested public remembering any of them. Whereas the SNP Government’s tally of ministers has swollen to 23, Labour has gone two better and appointed 25 to their front bench. How that makes the remaining 13 backbenchers feel can only be guessed at. But if that number appears cumbersome, consider the potential for turf wars over the myriad briefs, especially given relative lack of ‘bottom’ or experience in those who are exalted. In her quest to move younger/newer blood into the limelight, Ms Dugdale has built an unwieldy structure that also seems dangerously unbalanced. Several of her key spokespeople have only 4 years experience in parliament— and the whole shooting match barely averages 8. Why Mary Fee’s 4 years as a councillor and twenty-plus as a shop steward qualifies her to steer both party and parliament reform is entirely unclear. On the other hand, those left out average 12 years experience and include many former ministers, never mind shadow frontbenchers. The absence of the well liked, experienced and capable Malcolm ‘Jessie’ Chisholm is a puzzle all by itself. Certainly, half of them can be seen as ‘The Old Guard’ and excluded from any bid for a fresh start. But we may be in ‘Ready—Shoot—Aim’ territory here. The whole shebang smacks of symbolism. Building on McColm’c criticism of fuzziness in the briefs, it is hard to see where the ideas and new policies that will restore Labour as a credible government in Scotland. Even the long-experienced members of her shadow cabinet have weak track records of making much of their briefs to date and appear to be in post for the sake of continuity. As an example, Iain Gray had the Education/Opportunity brief under Lamond. Yet he never laid a finger on the urbane Mike Russell, has failed to land any blow—far less unsettle—the less sophisticated Angela Constance and yet this summer had not two ideas to rub together in a speech supposedly lauding the opportunities of new powers being given to Scotland. And it may be unfair to pick on Iain; his colleagues have been equally duff in coming up with anything new, besides moans about what the SNP has or has not done in eight years of office. Jackie Baillie managed to criticise Vale of Leven hospital in her own constituency for something she inaugurated while she was Health Minister. Sarah Boyack has had Transport since Adam was a boy but, while the SNP moved from EGIP to Borders Rail to A9 improvements to the Forth Crossing, never made a mark of her own and indeed came close to losing a vote of confidence in her work. All in all, it seems a rum do when Kezia’s promised team of fresh horses turn out to be the same old nags who were still finishing the course when everyone had gone home. It’s a variant on the old seventies TV comedy Never Mind the Quality, Feel the Width. If she thinks by flooding the media with ministers comments she can hoodwink the punters into thinking something new and exciting is happening, her own 4 years of experience outside the student/party bubble have yet to teach her how the >95% non-politicians out there think—and vote. This entry was posted in Politics and tagged kezia; labour; leadership. Bookmark the permalink. Dave, surely there is no Scottish Labour Party.